HCM CITY — Việt Nam, which is among the world’s largest shrimp exporters, is expected to encounter difficulties in the future due to the impact of climate change, high production costs and other factors, according to experts. Breeding shrimp also consumes a lot of electricity. According to the EVN Southern Power Corporation, electricity demand for aquaculture increased from 7,800 MW in 2015 to more than 9,500 MW last year and is expected to continue to rise in the coming years. The use of electricity to run equipment in shrimp ponds has resulted in overloaded electricity grids in some places. “A strategy for efficient use of electricity in shrimp farming should be introduced to save electricity in the production process, and to reduce production costs," he said. Vũ Duyên Hải from the Directorate of Fisheries said that production costs were affected by feed, broodstock, electricity, labour costs and bank interest rates. In the long term, the sector, which breeds mostly two species, sugpo prawn and white-legged shrimp, needs comprehensive measures to reduce production costs. 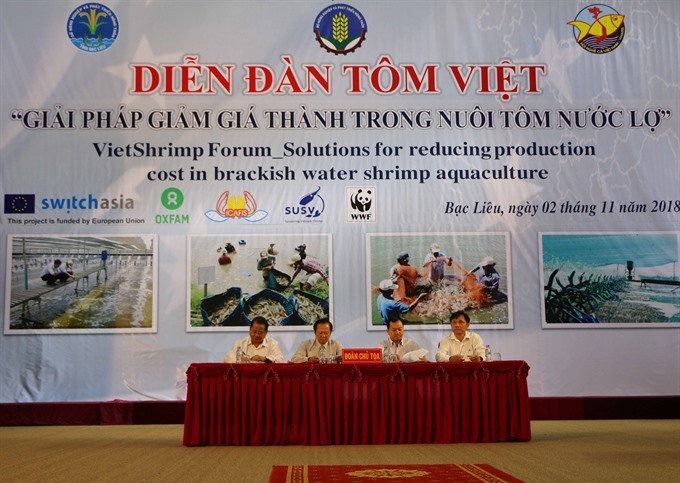 Trần Đình Luân, deputy general of the Directorate of Fisheries, said that scientists, management agencies and local authorities must use the Government’s existing mechanisms and policies to help shrimp farmers. In addition, businesses and processing plants should join hands with authorities to create more linkages between businesses, scientists and breeders. This would help farmers significantly reduce costs for broodstock, feed and other inputs. Speaking at the forum, Dương Thành Trung, chairman of the Bạc Liêu Provincial People’s Committee, said that after the Prime Minister asked the province to focus on high-tech shrimp farming, it developed more than 1,000ha of industrial shrimp farming with high technology, which had positive results. "Bạc Liêu has many high-tech shrimp farming models that have reduced input costs, improved the quality of shrimp and ensured increased income for farmers. Businesses have also paid a lot of attention to environmental protection,” he said. According to the Việt Nam Association of Seafood Exporters and Producers, the country earned US$2.62 billion from shrimp exports in the first nine months of the year, a year-on-year reduction of 4.1 per cent. Việt Nam’s total export revenue of shrimp products is expected to hit $5.5 billion by 2020 and $10 billion by 2025, according to the targets in the national plan.